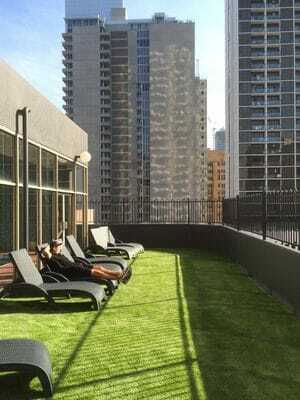 Endless Turf recently upgraded Mantra on the Park's pool area by installing a large strip of synthetic turf on a roof top section of their hotel. The artificial grass installation was a cost effective and aesthetically enhancing solution for this once outdated space. The rejuvinated pool area is now being enjoyed by hotel guests and the venue's General Manager, Michael McKinnon, was overwhelmingly impressed with the finished result. Click here to read his testimonial. If you have a roof-top or balcony space that needs a face-lift, contact us today for an artificial turf quote!